My cousin and fellow blogger, Allison Sebastiani, recently started a campaign called Gratitude Mondays. Each week, she publicly thanks someone who has had an impact on her life. I loved her idea, but I didn’t make a public promise to do the same. It was a nice invitation, but I didn’t think it was meant for me. I was wrong. Before the week was out, I received my very own invitation made up of one part coincidence, two parts gratitude, and whatever parts are left over to humility. The kids and I were visiting Huntington Beach last weekend and my brother invited us to go to church with his family on Sunday evening. As I sat in the back row of St. Bonaventure Catholic Church, my mind drifted to memories of a boy I used to know. He was tall, redheaded, freckle-faced, funny, sweet and kind. He wasn’t just any boy. He was my date to junior prom and senior homecoming, though not my date to anything in between. As teenage girls are known to do, I liked him and then I didn’t. I wanted to go out with him and then “something suddenly came up.” I am not proud of the way I handled my friendship with him, but at the time, it seemed perfectly acceptable. At 17, hormones and emotions ruled the day. As I sat in his childhood parish, Allison’s “Thank You” challenge came to mind and I was overwhelmed with gratitude for this now 40-year-old man, whom I hadn’t seen in over twenty years. I never planned to write this blog, but I knew what I would like to tell him if I ever got a chance. I would like to tell him that he holds a place in my heart as one of the kindest gentlemen I have ever met. He was my first model of what a gentle man is and what a gentle man does, a model I used to judge just about every man I dated after him. (Thank goodness Tim passed with flying colors!) I would like this man to know that his smile made my day, day after day, at Mater Dei. I would like him to know that his quirky sense of humor, his ability to be himself, his kindness to his family, friends and strangers were all things I appreciated about him. I would like him to know that being asked to those dances, getting dressed up and spending those evenings with him are some of my fondest high school memories. 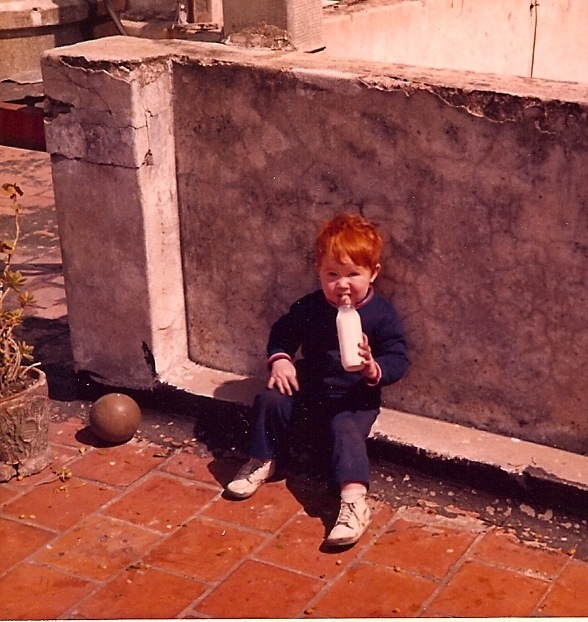 At one point in our friendship, he gave me a picture of himself as a toddler and from that moment on, I always hoped to have a redheaded, freckle-faced little boy of my own. Though I never got the hair, Finn’s freckles are part of what makes him my pride and joy. So as I sat and kneeled and stood and sang, my heart filled up like a helium balloon with thankfulness for who this man was and the role he played in my teenage life. He was just so good and I wondered how I could track him down and tell him so. But of course, I didn’t have to. As I walked into the communion aisle, who was coming out of the pew directly across from me at the exact same time? My redheaded friend, of course! I about jumped out of my skin I was so excited. I mean, GOD IS GOOD! This is the invitation I had been waiting for – the chance to tell him all the things I want him to know! This is awesome, I thought to myself and then I immediately punched him in the arm to get his attention, just like I used to in high school. He looked up from his holy reverie, shocked, because really, no one expects to get punched in the communion line, but come on! It’s been twenty years! He looked at me with really big eyes and kind of half-smiled and then returned his focus to the little space in front of him, occupied by his wife and their 3 young children. He seemed a little nonplussed to see me after so long, but that’s okay, I thought, because he doesn’t know what’s coming! He doesn’t know that I have a heart full of gratitude and a bunch of nice things to say to his wife about him. He doesn’t know any of that, but as soon as mass is over, he will! I kept an eye on him to find where they were sitting. I planned to run over as soon as the last song ended. I pointed him out to my kids, who have seen his picture in old photo albums. Keara giggled and said, “That’s your ginger, mom?” with a huge smile on her face. They were excited to meet an old friend of mine. But a funny thing happened before the last song ended. He left! He and his wife and his three darling, freckle-faced kids walked out of the building, without once looking my way to even nod, or wave goodbye. And as I watched them walk away, all the air got sucked out of my helium balloon of happiness. I went from walking on air to concrete boots. Part of it was that I wouldn’t have a chance to express my gratitude, but part of it was my wounded pride. In my fervor, I assumed my feelings would be reciprocated, at least in some small way. Though I didn’t expect the same level of excitement, I thought I might generate a friendly feeling, or maybe even a glimmer of curiosity about what I’d been up to all this time. And although I can’t know for sure what was going on in his mind, I don’t think I warranted a second thought. And that makes me sad, but it doesn’t make me any less thankful, which is why I’m writing this blog. I wish I could tell you his name and post our prom picture, so I could give him the credit I think he deserves. I wish I could use social media to track him down, but after the way our chance encounter played out, I have a feeling the publicity wouldn’t be welcome. Back in high school, our song was the 80s hit “I’d Melt With You,” but apparently it’s been replaced by Gotye’s “Somebody That I Used to Know.” He might like it better, but I don’t think it has quite the same ring to it. What I need to remember is that gratitude is a gift – to us. It makes our hearts larger, softer and more open to life. It makes us bigger, kinder, more positive people. Expressions of gratitude are a gift we give to other people and as gifts, they can be accepted or rejected. We can’t force it down their throat. A lot depends on who’s offering, but it doesn’t change the fact that the attitude of gratitude (pardon the cliché) is what’s most important. I limped out of St. Bonaventure with my thwarted plans and busted-up ego. I called Tim and told him the story and he laughed with (or at) me (I’m not sure) and I felt better. I had dinner with my kids, my parents and my lovely little nieces. I laughed and loved and was grateful for their company and I was able to tell them so. I hope someday to be able to tell my redheaded friend as well, but first I have to make him stick around long enough to listen to me. Posted in Ego, Gratitude, Self-awareness and tagged as Allison Sebastiani, Catching Souls, gratitude, high school, Mater Dei, prom. Ali: Long time reader, first time commenter. Just want to say I was laughing with you, not at you. 20 plus years together and counting… I am no fool. Great point you make about holding on to the gratitude even though your emotions may have highjacked you and taken you in a different direction. Wow! I can’t believe this is the one that got you commenting, but I appreciate it. And it’s okay if you were laughing at me a little bit; i might have deserved it! Ali…this is so funny…I’m laughing with you…..been there too…………………:) Miss you! So glad you could relate Brianne! Always so uplifting to read your words. What a gift and we appreciate the sharing. I too had my attempt ignored some 10 years ago but my gratitude and fond memories persist…loved reading this story! I was screaming in my head…No! Don’t leave! Maybe not in this Earthly life but in Eternal life we will get our chance again. What a great thought to carry forward with me Angie! I’ll get my chance someday!